Perhaps everyone can breathe a sigh of relief now. Almost seven months to the day, the S&P 500 finally hit a new all-time high on August 24th. 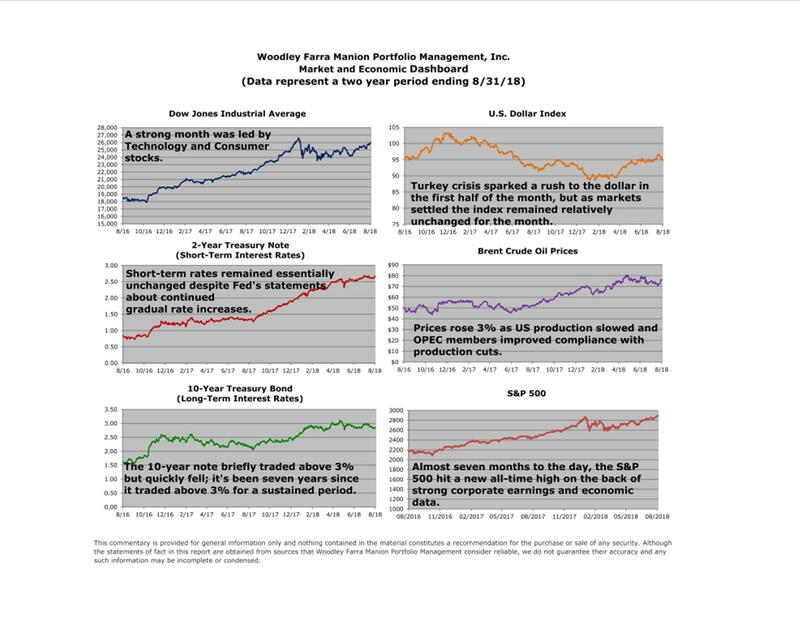 After the index peaked on January 26th it quickly fell 10% and then muddled along for the next few months, but steady progress since April has finally resulted in a new high. With all of the noise this year, some might be surprised to learn that the S&P 500 has returned 8.5% year to date and that by many measures we’re also in the midst of the longest bull market in history. So what now? Will the markets buck the dreaded “September slump?” Are the markets too optimistic? While most good things generally do come to an end, it’s hard to see that end coming soon: in the second quarter the economy grew at its fastest rate in nearly four years (4.2%), FactSet reported that the percentage of companies beating analysts’ second quarter earnings estimates was the highest (79%) since they began keeping track in 3Q08, consumer confidence is approaching an 18-year high, and progress was made on a trade resolution with Mexico, putting some added pressure on Canada and China. We may very well see the “September slump,” (a moniker derived from the fact that September has historically been the worst performing month for the S&P 500), but we think momentum heading into the end of the year is still to the upside. In addition to strong economic numbers, stock indexes of all sizes (large, mid, and small) are hitting new all-time highs in unison, a traditional hallmark of a healthy bull market. Fall will be here soon with cooler temperatures. Enjoy the new season!